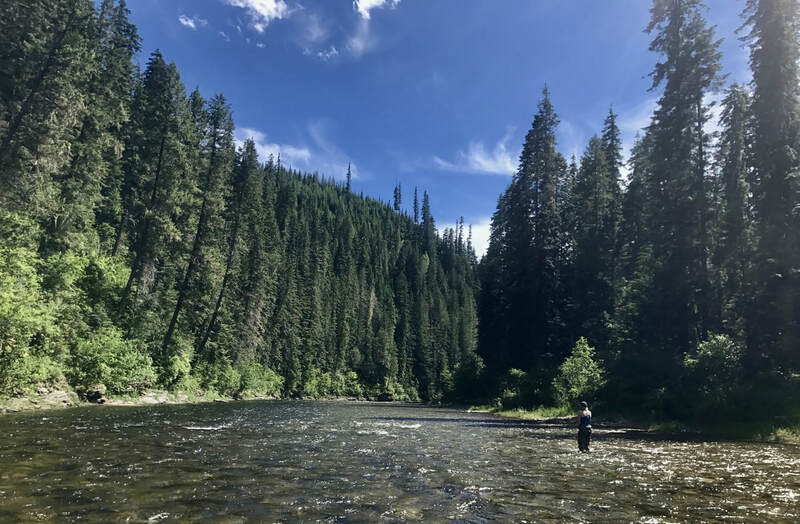 The North Fork of the Coeur d'Alene is a classic western freestone river. The river flows for 77 miles from its headwater in the Bitterroot Mountains to the confluence with the South Fork of the Coeur d'Alene by Kingston. It is a dry fly paradise where classic patterns if placed and presented correctly will yield native west slope cutthroat trout. But don't be afraid to throw some streamers as well. From Wallace it is an easy 30 minute drive up and over Nine Mile Creek Road to Prichard. This puts you at mile 20 on the river with a choice to head up river or down river. The St. Joe River is probably one of the most beautiful rivers you will ever fish. Like the NF of the CDA it is a classic western freestone river. Some consider it the best cutthroat river in Idaho. That is a strong statement considering some of its cousins in south east Idaho. The St Joe's headwaters are in the Bitterroot mountains on the Montana/Idaho border. Large dry flies such as Stimmies, caddis and renegades will bring eager west slope cutthroats to the surface. Or tie on a St. Joe Special tied locally for our shop. The Clark Fork river is the largest volume river in Montana. It starts as the Silver Bow Creek 5 miles from Butte Montana. It then travels 310 miles to Lake Pend Oreille in the Idaho Panhandle. Some of the best trout water is the 45 mile stretch by St. Regis, Montana. The Clark Fork is big water and the best way to fish it is from a drift boat. ​ Because runoff the Clark fishes best starting in mid-June. July and August offer some great hopper action. In the fall the BWO hatches come off and offer some great small fly action. Don't be afraid to tie on a large streamer for some big hits from the Rainbows that reside in this section. From Wallace take I-90 to St. Regis exit.